I woke up this morning to the energetic voices of women speaking Spanish in the room next door. They had talked non-stop the entire night before and I wasn’t sure how they could possibly have even more to say. Though it was 5:30am, yes, 5:30am when they decided to have their next batch of discussion. It made me feel so blessed I wasn’t traveling with a chatty person who every day would be like that – constant talking, with no break, no silence, no downtime. I had to turn on the music to tune them out until they finally left and it was silence, beautiful silence. My sniffling and coughing started instantly as the Sudafed did not magically cure me overnight as I’d unrealistically hoped it would. Though I was so excited to see Moscow I figured I’d try to make a go of it anyway. First stop was for a cappuccino to soothe my sore throat and boost my energy. The Kremlin was about 10 minute walk from the hotel and has to be one of the most beautiful architectural areas I’ve ever seen. I was instantly in happy-vile. It’s like an architecture lovers dream come true. 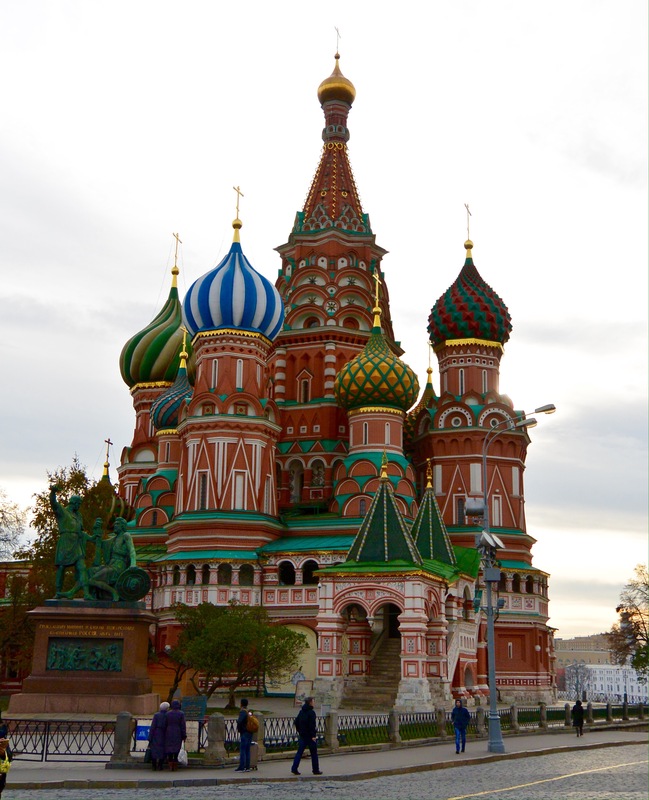 The St Basil’s Cathedral was colorful and ornate with decorated onion like turrets. Reds and blues and greens. It dominated the Red Square in all it’s beauty. I couldn’t stop staring and I’m certain I have a least a dozen photos. Just seeing that building was worth the entire trip. It wasn’t open today so it’s on the list to tour tomorrow. Directly across from it is the State Historical Museum which has a rather boring name for such an architectural beauty. It’s red brick façade with two large ornate gold plated steeples deserved it’s own selection of a dozen more photos. Inside the Kremlin is certainly a half-day experience. The lines were long and already forming at 10am when it opened. I hurried to get my place in line and followed the crowds who all seemed to know where they were going. Into the State Kremlin Palace. Oh wait! Apparently they were all here for a summit of sorts and I was ousted into the tourist sections. Oops. The building was far from a palace and looked more modern. Just outside was where all the goods were to be had so I was on my way. There was literally no one. Me and the entire square filled with multiple ornate beautiful churches with gold turrets. I took photos from every angle like I was in a rush knowing my time of solitude would be up soon. Slowly more and more people starting showing up until the hordes of large tour groups appeared on the scene and lines were everywhere. I started with the Annunciation Cathedral which is where the women were buried and then to the Archangel Cathedral which is where the men were buried. The Ivan the Great Bell Tower was already booked for the day (or that’s at least my best guess for all the Russian dialogue that ensued when I asked to buy them unsuccessfully), though the lower half had gorgeous recreations of time period gowns and absolutely stunning Cartier jewelry from the early last century. Wow. The Assumption Cathedral seemed to be the one that attracted the large groups so I whizzed through it pretty quickly dodging swarms of people hearing live narrations in many different languages, none of which were English otherwise I may have lingered a bit. Ha! The ceilings were multiple stories in height and there were paintings one every once of the wall. Unclear how much was original versus recreated or touched up, but they were very well done. I had to wonder what kind of ladders or scaffolding they had in the 15th and 16th centuries to paint the upper parts of the walls. After taking a few more photos and wandering around the whole inside of the walled area, I headed back out onto Red Square which had acquired quite a few more people from earlier in the day. My cold had really set in and I’d run through the entire roll of toilet paper I hid in my purse to use in place of Kleenex. It was time to refill. Where better than the high end mall – ha! Inside the GUM were stores like Gucci and Tiffany’s, Boss and Cartier, and so forth. On my way to the restroom I stumbled on a pharmacy that had travel size Kleenex in the window. Not just any tissue but Kleenex brand itself and a picture that I could only guess meant Kleenex with lotion. So happy. Bought the whole 10 pack! Walking around like Rudolph with my bright red nose and cheeks from all the nose blowing, I was a bit tattered and energy levels slowly disintegrating. On my walk back to the hotel I passed a place I’d read about online and thought about trying, 5642. Turned out to be Turkish or middle eastern of sorts, which was fine by me. I started with pumpkin soup to soothe my sore throat and finished with grape leaves stuffed with veal to get a little protein. The portions were huge and I couldn’t finish either. Next to me was a man that was listening to a movie or TV show on his iPhone without a headset. This wasn’t a cheap restaurant either, so not sure how that’s normal but no one told him not to which was weird. At this point the medicine had worn off, I could barely function and the need for tissue had increased rapidly to a point it was probably annoying for everyone around me. Time to go back to the hotel for some hot tea and a nap. The next dose of medicine paired with some rest did not seem to render any progress. This cold is going to be the kind that just needs to run it’s course. Joys. The WiFi had been down in the hotel all day so no way to contact the outside world, validate train schedules, upload pictures, etc. Even the TV didn’t work and I’ve become quite fond of the Russian MTV. After about an hour of self-convincing, I dragged my sick body out of bed to go to the grocery. I knew if I felt better tomorrow I’d want to see more of Moscow and not waste time grocery shopping for the 5-day train ride, so it had to be today. Luckily the grocery store was a couple minute walk away. It was small and New York style with tiny selections, high prices, and odd placements of things. At this point, I didn’t feel well so just wanted to get the food and be done. Hmm… Oatmeal and apples for breakfast, peanut butter and bread for lunch, carrots and ramen for dinner. Top that off with a couple jugs of water, a thing of juice, and a couple bottles of wine. All set. Rumor has it that there’s plenty of food to buy on board but having seen prices on the last few trains I was hoping to not spend that kind of money. Alternatively there’s also options to buy at the stops, though that means I’ll have to leave the train which makes me nervous as it will not wait for me if I miss it and could take all my stuff with it. Yikes. Secondly the selections will be limited. Needless to say, I figured for me, bringing my own made the most sense. The rules are – doesn’t need to be refrigerated and only needs hot water (which the train provides for free). They also supposedly provide coffee and tea. It’s not clear if I’ll have WiFi on the train as rumor has it if WiFi exists it will be spotty, though many trains across Siberia have no WiFi. Fingers crossed otherwise it will be 5 days without any way to check in! Needless to say, with the late lunch and not feeling well, tonight is not going to be any more exciting than yesterday. I’d love to say I saw more sights or walked over to the Red Square for nighttime shots, but no, this sickly lady stayed snuggled in her hotel room wishing and hoping this darn cold would go away. At this point, I’m not sure which is more uncomfortable my sore throat or my sand paper nose. We were just in Moscow in May. Such a nice city compared to the impression you get outside of the country!